This Sunday, credibility. President Trump and the lack of civility in politics. A week that began with a fight over what President Trump said to a grieving window. Sarcastically he said, "He must have known what he signed up for." Now how could you say that to a grieving widow? Didn't say what that congresswoman said. Didn't say it at all. She knows that it. Ends with two former presidents criticizing the current one, without mentioning him by name. Our politics seems more vulnerable to conspiracy theories and outright fabrication. If you have to win a campaign by dividing people, you're not going to be able to govern them. My guests this morning on civility, healthcare, tax cuts, and that attack and U.S. soldiers in Africa. Senate Democratic Leader Chuck Schumer and Republican Senator Lindsey Graham. Plus, that Republican civil war. There's not been a more destructive presidency than George Bush's. More evidence that the Republican party is showing signs of splitting in two. And in the wake of the Harvey Weinstein scandal, we asked female senators to share their "me, too" stories with Meet the Press. And he slammed the door and lunged for me. So I've had that kind of thing, I've been propositioned. You know, I have a story. And he looked at me and he paused and he said, "Well, did you bring your knee pads?" The remarkable stories of what happened to powerful women early in their careers. Joining me for insight and analysis are Tom Friedman, columnist for The New York Times, Danielle Pletka, of the American Enterprise Institute, Robert Costa, national political reporter for The Washington Post, and Helene Cooper, Pentagon correspondent for The New York Times. Welcome to Sunday, it's Meet the Press. 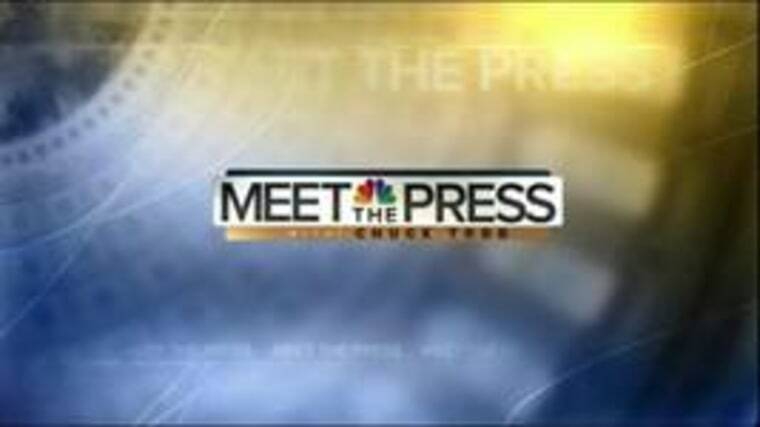 From NBC News in Washington, the longest-running show in television history, celebrating its 70th year, this is Meet the Press, with Chuck Todd. Good Sunday morning. The was a week when attention should've been focused on issues with real-life consequences, the future of healthcare, tax cuts, and an ambush in the African country of Niger that resulted in four American servicemen being killed. But it was a sideshow around that Niger battle where President Trump reportedly said to the with widow of one of the fallen soldiers that dominated headlines and illuminated once again the erosion of civility in our politics. The serial battles that President Trump engages in with Democrats, the media, and even members of his own party, appear to prompt two former presidents and a former presidential nominee to lament the lowering of the national discourse in the age of Twitter, and by implication, at the person they believe is responsible for it. The latest Twitter-slash-cable-catnip-soap-opera began when President Trump claimed incorrectly that he alone among presidents has made a point of calling and comforting the families of American service members who died in defense of their country. If you look at President Obama and other presidents, most of them didn't make calls. A lot of them didn't make calls. An ugly week in politics when even condolences to gold-star military families became politicized. Didn't say what that congresswoman said. Didn't say it at all. She knows it. Florida Congresswoman Frederica Wilson says the president told the widow of Sergeant La David Johnson that your guy knew what he signed up for. He doesn't need to talk about what people sign up for. That is unconscionable. Mr. Trump, rather than going out himself, sent his chief of Staff to clean up the mess. If you want to get into a debate with a four-star Marine general, I think that that's something highly inappropriate. Last night, all five living former presidents gathered in Texas to raise money for hurricane relief, an effort they are calling the One America Appeal. The heart of America, without regard to race or religion or political party is greater than our problems. Mr. Trump taped a video message as well. Through this effort, all five living former presidents are playing a tremendous role in helping our fellow citizens recover. It was a show of unity after a week in which Presidents Bush and Obama broke the ex-presidents club code of silence and indicted President Trump's brand of politics without ever mentioning him by name. Bigotry seems emboldened. Our politics seems more vulnerable to conspiracy theories and outright fabrication. Echoing another rebuke of President Trump, this one by Senator John McCain. For the sake of some half-baked, spurious nationalism, cooked up by people who would rather find scapegoats than solve problems. While the White House chose not to respond to either former presidents' critique, Mr. Trump's former chief strategist, Steve Bannon, did respond in a blistering attack on President Bush Friday night, and called for open revolt inside the Republican party. President Bush to me embarrassed himself. He has no earthly idea whether he's coming or going. Just like it was when he was president of the United States. There's not been a more destructive presidency than George Bush's. And as for the president himself, he so far as only responded directly to Senator McCain. People have to be careful, because at some point, I fight back. You know, I'm being very nice. I'm being very, very nice. But at some point, I fight back, and it won't be pretty. Well, joining me now is Republican Senator Lindsey Graham of South Carolina. Senator, welcome back. Lovely morning. I know you guys love being on here in weeks like this. Let me ask you. Look, you were tough on Candidate Donald Trump. In fact, I think right before you got out, you called him a "race baiting, xenophobic, religious bigot." You heard what President Bush said. Where are we? Well, he won, I lost. President Bush is still popular in the Republican Party. But Donald Trump couldn't have won without rejecting the last 16 years, really, when you think about it. There were a lot of people like Bush running in our primary, and all of them got creamed. And Clinton was not the greatest candidate, but if President Obama was what the American people would want to continue, then Trump wouldn't have won. So I'd say to both former presidents, I admire President Bush a lot, President Obama, I don't think any of us get why President Trump won. You don't understand yet why he won? What do you? You just said you didn't think. You don't think they understand? I think they don't. I don't think that they do. I think President Bush, I’m more in the Bush camp on foreign policy. McCain's speech was about, "We're not going down to Bannon road." When you look at who's around President Trump, he's got more people like John McCain and Lindsey Graham than he does Bannon, so I'm hopeful. But in the primary, he rejected basically the Bush model of foreign policy and in the general election, he basically rejected Obama. But that's on substance. That's on substance, and that's fine. But when did civility become an ideological issue? When did this idea, "No, no, no, no, it's more important to be pugilistic, it's more important to land that punch"? No, I agree with that. That's what I would argue what both former presidents were referring to. That they were not trying to get ideological here. Well, it became part of the discourse when he came down the escalator. The first thing Donald Trump talked about was pretty tough. And he never stopped and he won. Well, what does that say about us then? It means that we want somebody who's not traditional, that we're sick and tired of the status quo, whether it be an Obama or Bush, and that people felt so bad about their government, they have nothing to lose, they were going to pick a guy that was rich, that liked being rich, and says, "I'm going to make you rich." A guy that says, "I'm tired of being all over the world, involved in everybody's business except ours." And guess what? He won." All right, but look at this week. And you ask yourself, "Why couldn't he take the high ground on the condolences?" And that's what it is. It's not about, to me, in business, the customer's always right. In this, the grieving widow is always right. I'm sorry. I don't care what the story is. So I guess I ask you, why do you think he couldn't take the high road? This all started when they criticized, "Have you reached out to the four fallen soldiers' families?" Then he brings up President Obama, which is absolutely the worst thing to do. There's no doubt in my mind that President Obama and Michelle Obama, their heart broke every time a soldier fell on their watch. There's no doubt in my mind, having been around President Trump a lot lately, that he loves the military. So General Kelly tried to give him some advice about how to talk about these things. President Trump may have delivered it inartfully. But I can promise you this, if I'd been in the car with somebody and President Obama was on the end of the phone, I would not have politicized this like Congresswoman Wilson. Well, there there are no winners here. You know, and it feels as if everybody is trying to sit here and find blame on the other side. CHUCK TODD: -- yeah, willing to do this. That would be willing to go and leave their family -- to a place out in the middle of nowhere to fight terrorists, so they don’t come here. And I would just urge President Trump: let’s talk a little bit about the four soldiers. How about a little time on who they were? And why they did what they did. And all those like them. Alright, I want to know -- I think a lot of people want to know -- why they were there and what we were doing there. And I’m going to go through a quick timeline because we don’t know a lot. On October 4th, we were told, after this happened, that they were there to do “counterterrorism training.” October 5th, it was a “reconnaissance patrol.” On October 6th, we were told they were there to “establish relationships with local leaders.” John Kelly, on October 19th, just three days ago, basically said, “I actually know a lot more than I’m letting on, but I’m not going to tell you.” John McCain had to threaten a subpoena just to get Jim Mattis -- the secretary of defense -- to come down and talk to you guys even briefly. What more can you tell us about why we were there and what we were doing? Well, they’re going to brief us next week as to why they were there and what they were doing. I got a little, little insight on why they were there and what they were doing. I can say this to the families: they were there to defend America. They were there to help allies. They were there to prevent another platform to attack America and our allies. Senator McCain is frustrated, rightly so, we don’t know exactly where we’re at in the world militarily and what we’re doing. So John McCain is going to try to create a new system to make sure that we can answer the question why were we there, we’ll know how many soldiers are there, and if somebody gets killed there, that we won’t find out about it in the paper. And John McCain -- and I think General Mattis -- are going to come up with a new process, I hope. Alright, you used some alarming words when you said “we don’t want the next 9/11 to come from Niger.” So you’re making the case then that this is all part of the same war that you guys authorized in 2002, in 2001, that the same war that you authorized -- that we thought about Afghanistan, then it turned to Iraq. Then, it’s been used for Libya, for Syria and now we’re in another continent. Yeah, I don’t think the forces inside of Niger, the ISIL-affiliated forces, have the capability to attack the United States. But what happened in Afghanistan is that you had a government that fell, replaced by a radical organization, the Taliban, a government, that invited international terrorists in and to be their welcomed guests. So what I worry about Africa, it becomes the new platform for people to come to. The ungoverned spaces of Africa is where the terrorists will come after you defeat them in Syria and Iraq and Afghanistan. And there are some groups within this system of terrorist groups in Africa that would attack our allies or the United States. So there's no victory here? And I say this because this is a week, we got Raqqa back. I mean, that's the irony. So you make substantial progress against ISIS in Syria and Iraq. And yet, now it's whack-a-mole and now they're popping up here. This goes to the same thing we had ten years ago with, "Oh, we're pushing Al Qaeda back." But then Al Qaeda reformed with a new name. It's a generational struggle. If you don't think it's a generational struggle, you don't understand the war. If you think it's limited to the Mid East, you don't understand the theology. It is spreading throughout the world, particularly Africa. And if you think it's going to be done in a short period of time, or if you can't-- if you tick off means of how you fight this war, there's an authorization to use force tomorrow that limited the war based on time, geography, and means, I would have voted against it because the war is now morphing, it's going to places that we haven't heard of before. To the American people, we're going to follow the terrorists wherever they go. We're going to use whatever means we need to with partners to destroy them. And whatever time it takes, it takes. And most people are not ready for that, but I am. Are we going to need a new war authorization? It sounds like you're arguing no. But by the way, you're going to be in the minority, aren't you? I don't know. I’m arguing that the current authorization as long as it’s related to radical Islam is enough. But here’s -- the military determines who the threats are, they come up with the engagement policy and if we don’t like what the military does, we can defund the operation. But I didn’t know there was a thousand troops in Niger. John McCain is right to tell the military because this is an endless war without boundaries, no limitation on time or geography, you gotta tell us more. And he’s right to say that. All right, before I let you go, you've come on this show numerous times and said, "Russia needs to be punished." You passed a tough sanctions bill. You passed it in July. The president signed it in early August. There was a deadline of October 1st. It is not October 1st. It is October 20th and the sanctions have not been implemented. Why? I think that the Trump administration is slow when it comes to Russia. They have a blind spot on Russia I still can't figure out. But I can tell you what happened in '16. Can you? At what point is that circumstantial evidence to you, sir? Well, all I can say is that wherever the Russian investigation takes us, it will take us. In '16, they interfered in our elections, I don't think it affected the outcome. But in '18 and '20, they're coming back against us. What are the rules of engagement? Did what they do in 2016, did that amount to an act of war? How do you respond to cyber threats? We're really not well together as a nation in terms of the threats we're facing from the cyber arena. But Russia is going to get worse, if not better. Mr. President, go after Russia because they're coming after us. All right, but how are you going to hold him accountable if he doesn't implement these sanctions? The Congress will have a way to hold the president accountable. I think he's beginning to understand the threats we face better and better each day. All right. Senator Graham, I will leave it there. Sir, thanks for coming on. No four-letter words this time. Well, the day is not over. Okay, fair enough. We'll see what my next guest thinks. And joining me now is the Senate Democratic Leader, Chuck Schumer of New York. Senator Schumer, welcome back to Meet the Press, sir. All right. I want to start actually with Niger, because I've got to ask, as the Senate Democratic Leader, have you been briefed? Not yet. I hope to be briefed early next week. Why haven't you been briefed? Was Jack Reed briefed? No. I don't believe he was either. He sent a letter along with John McCain demanding that they come in and brief him. I understand that. I guess uh if you get this briefing and you heard what Senator Graham believes this is part of part of the larger battle against radical Islamist fundamentalism and the spread of it, the cult-like spread of it now taking place in Africa. What does this mean for the war authorization? You heard Senator Graham there. He didn't know we had a thousand troops in Niger. Did you? Uh No, I did not. And what it means, uh Chuck, for the war authorization, is I agreed with Senator Paul that we ought to look at this carefully. We are in a brave new world, you know, there are no set battle plans. You don't declare war and then fight three weeks later. But having said that, the constitution says Congress has the power to declare war, and if you're in a long-term war, Congress ought to keep that ability. So we need to reexamine this. We're on a A.U.M.F. that extends uh 16 years, from right after we were attacked at the World Trade Center. So I would be for reexamining it. Absolutely. There's no easy answer, but we should look at it. The answer we have now is not adequate. Is this ho-How do you describe it any other way than never-ending war? Well, look, tech-technology has allowed terrorists to do bad things to us. Our military is very, very good. And uh that's why we're having such success in Syria and Iraq. But we have to keep at it. Let me stop you there. Why is that considered a success? I say it this way because it seems as if, okay, we had success in Afghanistan until we didn't. We had success in Iraq until we didn't. We had success, you know, Raqqa, and then all of a sudden now, it's popping up in Central Africa. The point I guess is how do you define success? Because it seems these short-term victories are just that, short term. Well, two years ago it looked like the ISIS would have a caliphate. When they had territory, they can get money out of the big cities, Mosul and Raqqa and all the others. They can't do that. Can they still try to hurt us? Yes. And we have to do everything we can to stop it. But to say that we haven't won the war isn't to say that we haven't had some successes. Alright, I'm going to move to healthcare. It seems as if the Democrats are a lot more enthusiastic about the bipartisan deal between Senators Alexander uh and Murray than the Republicans are. So let me ask you this. It's clear that the the administration wants a little bit more in this deal in order to get these payments back, these subsidy payments back to the insurance companies in order for low income. So what are you willing, are you willing to do more? Look, this is a good compromise. It took months to work out. It has a majority. It has 60 senators supporting it. We have all 48 Democrats, 12 Republicans, I would urge Senator McConnell to put it on the floor immediately, this week. It will pass and it will pass by a large number of votes. That'll put pressure on the House, because let's not forget what this bill does is prevent premiums from going up 20 percent, even more in some states. That falls on everybody's back. And if Republicans think that uh if premiums go up they're going to avoid the blame, if Senator McConnell thinks that, he's wrong. So for the substantive reason, preventing premiums going up, that's number one. But two, because the Republicans are in charge, and they should be coming up with a solution and Senator Alexander, their leader on health care did, we should pass it and pass it now. You can always say, "I won't pass it unless this happens." And then a Democrat says, "I won't pass it unless that happens." Let’s -- we can get together in a bipartisan way, the president urged it originally. He called both Senators Murray and Alexander and said, "Come to a solution." Then they come to a solution. The right wing attacks it and he backs off. That's not leadership. --and start leading. Roll up his sleeves, solve problems, don't attack so-called enemies, that’ll reduce the coarsening of the debate that you correctly point out. --the Republicans are the ones in charge. No. We gave on copper plans. You know, the Republicans always wanted copper plans. These are minimal plans. We didn't like it. I remember during the healthcare debate, President Obama didn't like it. That was a big concession. You can't negotiate a deal, shake hands on a deal, and then say, "I'll do it only if you add this." Then the other side says, "Well then, add that." And the deal collapses. We have one now. And if you're going to let the perfect be the enemy of the good, you won't accomplish anything. So you're not budging? There is no movement? You're done? You're done? Are Democrats done negotiating? We have a very good deal. McConnell should put it on the floor, it'll pass overwhelmingly. If if Ryan puts it on the floor, it'll pass the House overwhelmingly. And the president would sign it. But you didn't answer if you're done. Are you still willing to talk? We are-- we have an agreement, we want to stick by it. I understand that. Are you willing to talk or no? We are sticking to the agreement we have. Put it on the floor. See if it fails. I mean, you're asking me to negotiate against myself. And I've been around long enough I don't do that. Fair enough. Let me ask you about deals with the president. Uh It looked like you guys had a deal on DACA. Now it appears as if the-the-the delay, the idea of Congress codifying the protection for these these so-called dreamers is going to get uh postponed again. Is that what's happening? The president is going to protect--sign an order to protect them longer than March of 2018, extends it through the end of the year in order for you guys to keep negotiating? --of the Republican Party run the show, or his presidency will not accomplish anything. And that's the greatest rap against him, even with his supporters. So what he ought to do is follow through on the agreement he had with Leader Pelosi and I. If not, we will figure out a way to get this done before the end of the year. We think it's really important. So you still think end of the year, fair enough. And finally, the president targeted you this week on the issue of Iran. He said, "Dem. Senator Schumer hated the Iran deal made by President Obama. But now that I am involved, he is okay with it. Tell that to Israel, Chuck." Senator, may I ask you this, why aren't you happy that you have an opportunity to potentially uh make the deal tougher or to renegotiate the deal? Why aren't you embracing the president's move here? Well, General Mattis isn't. General Mattis and our-our military leaders, I believe the secretary of state as well, has said that it's not in our national security to undo the deal. Let me say two things. First, if we were to undo the deal, Iran would not be squeezed because the Europeans would continue to trade with Iran. And sanctions only work if we all do them. Even though I was against the deal to begin with, I thought it could have been negotiated much better, we're in a different situation now. Second, the most immediate threat from Iran is not as part of the deal which everyone agrees they have not violated, the nuclear part, but two other things. One, I.C.B.M.'s. They're building them. Real danger.Two, they're arming Hezbollah to the teeth, particularly in Lebanon with rockets that could really damage Israel. We ought to come up with tough new sanctions that go after Iran on those things, but don't violate J.C.P.O.A. We have already enacted some sanctions, and the president, as usual, he's tweeting away. But just like with Russia, he hasn't even enacted these sanctions. This presidency doesn't get anything done. All he does is spend his time tweeting and degrading his so-called enemies. That doesn't work and demeans the presidency. All right. Senator Chuck Schumer, Democrat from New York, Senate Democratic Leader. I will leave it there, sir. Sorry about the Yankees. Got to throw that in. Sorry about the Yankees, gotta throw that in. Sorry bout’ the Yankees. Well, you know, it's all right. It's good for Houston though, they need something to pull for. How about that? All right, thank you sir. Coming up, the future of healthcare. Taxes and the loss of civility in our politics, and then later. Yes, I have a "me, too" story too. And I've been propositioned by teachers, by my colleagues. On sexual harassment, four U.S. senators tell their "me, too" stories. Welcome back. The panel is here. Robert Costa, national political reporter for The Washington Post, and moderator of PBS's Washington Week. Helene Cooper, Pentagon correspondent for The New York Times, Danielle Pletka of the American Enterprise Institute, and Tom Friedman, columnist for The New York Times. And his latest best-seller, Thank you for Being Late, is now out in paperback. So he's now a paperback writer. Just a little Beatles reference every now and then, right? Come on, a few people get it. Maybe, yeah. I got it. A few people get it. Tom Friedman, I'm going to start with you. We had two former presidents break the code. Okay, the code of ex-presidents, going that extra level of backseat driving the current occupant. And look, it's not as if Bush and Obama hadn't made their opinions known about Trump during the campaign. But how seriously should the public take this? Well, I think what's going on, Chuck, is a real crisis of authority. Something I talked about on the show once before, I quoted my friend Dov Seidman who said, "There's a big difference between formal authority and moral authority." So we have a president who has formal authority, but I would argue he has lost all of his moral authority. That is why last week he had to bring out General Kelly, a four-star Marine general, because he still had formal authority and moral authority. Unfortunately, General Kelly, by saying things that were provably false about that congresswoman, really lost, I think, a lot of his moral authority. And now we have a situation where the White House spokeswoman had to invoke his formal authority, that he was a four-star Marine general to basically shut up the press. And I think that's the tragedy here. Like, everyone has lost their moral authority. And I think that's a real crisis for the country. Because when we're in a real crisis, and we need to trust General Kelly and the president, I think something's been lost here. You know, Dani, here's how Peggy Noonan sort of put it. She writes, "F.D.R., Teddy Roosevelt, and Ronald Reagan were pretty tough hombres. But they always managed to sound like presidents and not, say, John Gotti." Yeah, but again, I think President Bush, with all respect for the analysis about moral authority, which I think is very fair, I think that President Bush and President Obama actually don't get what the issue is. There's a crisis effacing government. The American people, much like many people around the world, don't believe that government is in this for them. Don't believe that they're being served. Think that they're corrupt. Think that they're dishonest. What those two gentlemen said, while we all at the table may agree with them, aren't actually going towards solving this problem. But should we be concerned that their anger is based on fabrications in many ways? Like, they're angry at things that didn't happen, but they think they did because they're being fed divisive rhetoric. Well, you might as well say, and I might as well say, well, that's because of the fake news. But it's a vicious cycle that we're in. But, I mean, we need to answer the crisis of faith in our leadership, not simply focus on the fact that Donald Trump is there. Lindsey Graham was absolutely right. Lindsey Graham said, "This isn't just about what one guy." He got elected. We may not like it, but he got elected. What are those folks looking for? I think it's pretty hard though to talk about restoring Americans' faith in the government when you have the representatives of the government standing in front of the American people and telling demonstrably false stories. I think Tom is completely right that General Kelly lost a huge amount of credibility when he said what he did about Representative Wilson. And that just takes away, I mean, you see this White House constantly bleeding out these credibility issues. When I was at the Capitol this week, I talked to some senators on the Republican side and some House members. A lot of them echoed Senator Graham. They said privately, they're in lock step with President George W. Bush. They respect President Obama's comments. But they believe the country, in part because, they told me, about the Obama and Bush presidencies, has lost faith in the institutions, of the national political parties. And because of this rising populism and just general frustration, the leaders in Washington don't feel able to navigate this moment.But okay. Why can't you have this populism, why can't you have this anger without? Look, David Brooks wrote this, "Barbarism and vulgarity we have in profusion. Through his daily utterances, Trump is influencing the nation in powerful ways. Few would say he is spreading a contagion that we'd like our children to catch." The point is, the idea of role model and going back to your moral authority, can't the president do this, torch the establishment and at the same time, set a high bar of laws? I mean, there's so much elitist twaddle being sort of slapped around about all of this. And the answer is that Donald Trump is a reflection of something and he is who he is. For those of us who don't like it, for those of us who can't deal with it, the right answer is to figure out how to have candidates out there who aren't Roy Moore, right? And who aren't Donald Trump. And how the American people will elect them. And nobody's talking about that fact. You know, Chuck, the biggest industry in America today is the anger industry. Because we have technologies now, Twitter, Facebook, Instagram, that allow so many people to participate in arousing, and also videos and pictures. And the whole country is just out there arousing each other through video and pictures and what not. And I worry that we're really fighting this technology. It's just so easy to get a lot of people stirred up and you don't have to be president to do it. I've always said that actually the most honest thing that Alex Jones has ever uttered is the name of his show, Info Wars. Meaning this is a belief that this is not a debate on facts, it's weaponizing information, true or false. That's absolutely true. And that's where we seem to be headed now where you see people on both sides of the aisle and it's impossible to look at Facebook now without looking at the source of where is this coming from, and that sort of thing, because that seems to be what we're getting right now. But it also, I think the buck has to stop with the White House. Because I think at a time when you have our elected leaders and the appointed members of the Trump administration standing before the American people, there used to be a time where as president, you should know that there are things that you cannot say. You cannot come out in front of the American people and make demonstrably false statements. You mean like, "I did not sleep with that woman"? That kind of demonstrably false? Yes, and he credibly got a lot of flak back for that. But they're not having this kind of discussion on Capitol Hill. Because they bought into President Trump in the Republican party, they still feel like they've got to get a tax plan through, they've got to get healthcare reformed in some way. And even Senator Schumer, in his interview with you, he said, "Stop tweeting." But they're not trying to elevate the discussion into this national conversation. All right. We'll see if somehow tax cuts mollify Steve Bannon. I don't think they will. Anyway, coming up, when the Republican party establishment fights President Trump's base, who wins? Wait until you see the numbers on this one with the actual people. But up next, four U.S. senators tell their stories of being sexually harassed. And we are back. Data download time. The potential for civil war within the Republican party has been simmering for years. But is one side finally ready to actually split off? It seems as if the G.O.P. establishment has the upper hand in Washington with its tight grip on power. But the Trump/Bannon wing of the party may hold the edge out in the country, among the actual Republican voters. The best way to look at these two different kinds of Republicans may be looking at a county-by-county map of the country. In 2016, there were 235 counties where President Trump either won, but did worse than Mitt Romney by at least two points, or where Romney won, but it flipped to the Democratic side last year. These establishment Republican counties produced 11 million votes for Trump. But consider this. There were 1,839 counties where Trump won and did better than Romney by at least two percentage points. Those counties sent Trump 18 million votes towards his victory. 18 million to 11 million, you don't need a degree in math to know which side is bigger. The Trump-based counties actually produced more Republican votes in 2016. That's how important these folks are to the future of the G.O.P. These are the very places former White House advisor Steve Bannon is targeting in his insurgent war on the Republican establishment. So what makes these types of counties so different? Take establishment wing Delaware County, right in central Ohio. It's suburban, it's high income, it has a low poverty rate. Trump did six points worse than Romney. Now let's compare the Trump-based county of Wilkes County, North Carolina, in the northwest corner of that state. It's more rural, with lower income, and a higher poverty rate. Guess what? Trump did six points better than Romney. Look, these numbers show two very different sides to the G.O.P. right now. Sides that are going to want different things out of their leaders in Washington. Our own Dante Chinni spoke to folks in Wilkes County who talked about the need to blow up the G.O.P. and replace it with something else. That's how much they want to change this. The question of course is what does this new G.O.P. look like and can they govern? Here in Washington, the establishment wing may still have a grip on the reins of power, the 2016 results show outside the beltway, the Trump-Bannon base of the party is potent and it's growing as a force. When we come back, four women U.S. senators tell their stories of sexual harassment. Welcome back. The Harvey Weinstein story has brought to light the ugliness, the humiliation, and perhaps most of all the prevalence of sexual harassment and assault. Many of us, men mostly, were not aware or chose not to be aware of how common this kind of behavior apparently is. So we decided to do something different here on Meet the Press. This week we asked every female member of the United States Senate, all 21, if they had stories that they wanted to share about sexual harassment. Four senators, all Democrats, said yes. And told us of experiences early in their careers. Elizabeth Warren of Massachusetts, Claire McCaskill of Missouri, Heidi Heitkamp of North Dakota, and Mazie Hirono of Hawaii. Here now are their stories. He's chasing me around the desk, trying to get his hands on me. He pretty much put his finger in my face and he said, "men will always beat their wives and you can't stop ‘em." Yes, I have a "me, too" story too. I was a baby law professor and so excited to have my first real teaching job. And there was this senior faculty member who, you know, would tell dirty jokes and make comments about my appearance. And one day he asked me if I would stop by his office, which I didn't think much about. And I did. And he slammed the door and lunged for me. It was like a bad cartoon. He's chasing me around the desk, trying to get his hands on me. And I kept saying, "You don't want to do this. You don't want to do this. I have little children at home. Please don't do this." And trying to talk calmly. And at the same time, what was flickering through my brain is, "If he gets hold of me, I'm going to punch him right in the face." I was a very young state legislator and in my 20s and I was single. And I was nervous about getting my first bill out of committee. So I cautiously approached the very powerful speaker of the Missouri House of Representatives. Did he have any advice for me on how I could get it out of committee? I've been propositioned by teachers, by my colleagues, and, you know, you name it. When I started out as North Dakota's attorney general, one of the most significant things I wanted to do was I wanted to change the dynamic of domestic violence. And I had an event when I was speaking and a law enforcement official came up to me and he pretty much put his finger in my face and he said, "Listen here, men will always beat their wives and you can't stop ‘em." After several rounds, I jumped for the door and got out. And I went back to my office and I just sat and shook. And thought, "What had I done to bring this on?" And I told my best friend about it. Never said a word to anyone else. But for a long time, I wore a lot of brown. And then he said, “Well, did you bring your knee pads?” I do think he was joking. But it was shocking that he would make that joke to a colleague, even a very young colleague. And I think I was so stunned, because I thought, "Well, everybody's going to care about this the way I do. Everybody's going to think about this the way I do." And I looked at him and I said, "You know, you might be right. I hope you're not right. But we shouldn't live in a world where we don't try." My initial reaction was isn't it a shame that it took something as horrific as this kind of event to make people feel strong enough to actually speak up. And that the voices of all these women are so much stronger and louder together. You know, I wish I could say that I was surprised. But knowing my life and what happened to me early in my career, it wasn't shocking to me. And I understand why so many people keep things like that to themselves. Statements that are made, observations about our appearance, these kinds of unwanted attention occurs in a situation where there is an uneven power. And it's usually the woman who has less power. What it means now that so many people have spoken out, is it's a way to say, "We're here for each other." And it's also a way to say, "No. It's not about what you did. He's the one who stepped out of line. And this is on him." We all need to be part of the solution. But I think we have to achieve something within our families and within our children to say, "It's not acceptable." If you're raising daughters, to say, "Look, you may not think it's ever going to happen to you. In all likelihood, it will." And we should be raising sons to say, "I will never do this. I will behave differently." Usually it’s the males who are doing this to women, that they should know that this is not appreciated. And it's not cute. It's not fun. The first thing that I say is you're not alone. And the other thing I would say is if you feel diminished, that probably was the intent. And so don't think you're overreacting. We have to stick together, but it can't just be a movement of women. It has to be a cultural movement. To young women on campuses who have been sexually assaulted and who are worried that oh, they shouldn't have been with that guy, or they shouldn't have had anything to drink, or they shouldn't have been at that party, or they should've gone home with their friends, remember that does not excuse criminal conduct. You don't have to have perfect judgment to be a victim of a crime. Those were senators Elizabeth Warren, Claire McCaskill, Heidi Heitkamp, and Mazie Hirono. We'll be back in a moment to talk about how this conversation about sexual harassment and assault will continue to echo in the days and weeks ahead. Back now with endgame. All right, you heard from those senators and I believe it was Senator Heitkamp who said, "It needs to be cultural change." Are we in a culture, is this a major moment in our culture? Dani? So, you know, do we need a cultural change? If women want to stand up for themselves, women should stand up for themselves for equal treatment. And if that means that someone's going to harass them, they should stand up and call them out. This whole "Me, too, I want to get on the gravy train, Harvey Weinstein looked at me meanly too but I didn't have the guts, Gwyneth Paltrow, to stand up and do anything about it," I'm not really into that. Helene,I think that’s been- in The Washington Post today, a woman, Katherine Viles writes, "I'm a sexual assault survivor. 'Me, too' is incredibly isolating." Look, a lot of women have used this moment to speak out. And I think they should. I think that’s- but I also think that there are a lot of women, this whole idea of, "Why didn't you say something earlier, why are you waiting until just now to say something," sexual harassment can be such a personal issue. These are personal stories. And a lot of women tend to often end up blaming themselves for instance. They don't feel as if they're in any position, they don't want to call attention to it. I spent an enormous amount of time, this is my example of the whole speaking out issue. The president of Liberia, first woman elected president of an African country, and I've spent a lot of time doing a book about her, is a victim of domestic violence. Her husband beat her. In Liberia and throughout Africa, domestic violence is a huge issue. Ellen Johnson Sirleaf, this female political icon, didn't want to talk about it. I've spent so much time trying to get her to talk to me about it, because I thought she could be an example to all these other women. And it is something that I finally got it out of her, but she really did not want to address that issue. She didn't want to upset her children. She didn't want to seem as if she's pointing fingers at a husband who she also loved. There's so much wrapped up into this that I think every woman who wants to speak up should be allowed to do so and should feel that she can speak up when she wants to. But to- it's also very difficult to put the onus on the woman to talk at a time where she may not want to. You know, in the last year, right, two years, we've had Cosby, you've had Ailes, Harvey Weinstein, the accusations against Donald Trump, and of course every Donald Trump accusation brings a "what about Bill Clinton" moment. But the fact is, that covers everything. Politics, the media, Hollywood. Chuck, you have to believe there'll be at least some deterrent effect in watching what happened to Harvey Weinstein in this sense. That we live in an internet age where I can see inside of you, and with Twitter, I can tell the whole world about it without an editor, a libel lawyer, or a filter. There are people living in the Outback of Australia right now who know Harvey Weinstein's name. He's been shamed before the whole world. Yeah, I don't think this is the end, but all I'm saying is this is part of a process that we're learning that hopefully will have some deterrent effect. It was powerful to hear from those female U.S. senators to hear about their experiences, because they're in the U.S. Senate, not because of their gender, but because of all of their accomplishments. But it was a reminder of what many women have to endure as they go through their careers, especially those who have been around a little longer than others. And when you look at the Harvey Weinstein story, I think it's also a reminder of the power of reporting. You know about Harvey Weinstein because The New York Times took the time to dive into that story. And so while it's encouraging to see people on social media sharing their own painful experiences and senators doing the same, let's hope the reporting continues into corruption. All right. I'm going to end, I guess, try to end on, I guess, you can call this a lighter note. Jimmy Carter did an interview with Maureen Dowd this morning. And I have to say there was a number of eyebrow-raising comments. But let me just point out one for the table here. Former President Jimmy Carter, "I think the media have been harder on Trump than any other president, certainly that I've known about. I think they feel free to claim that Trump is mentally deranged and everything else without hesitation." By the way, it's under a headline of "Jimmy Carter lusts for a Trump posting." I think he wants to be on board for North Korea. There was a wow moment there. It was a little bit icky, frankly. I think the headline got it right. You think Jimmy Carter figured out that if you say nice things about President Trump, you can get something in return? Chuck, I don't know where he would've gotten that idea. Beyond the transactional part of this interview with Maureen Dowd you do see some similarities between President Carter and President Trump in this respect. They both came in as total outsiders to Washington. They also both clashed with the press. And President Carter, with his Malaise Speech in the late '70s, he was always psychoanalyzed by some of his critics. And so you can see a rapport as much as there's a transactional play perhaps. And by the way, he still hasn't forgiven the Clintons. Yeah. I don't know what to do with that. I was stunned by that. There is a lot there. But it all comes down, he's not gotten over snubs from the Clintons. All right, guys, that's all for today. Thanks for watching. We'll it's back next week, because if it's Sunday, it's Meet the Press. You can see more endgame in postgame, sponsored by Boeing, on the Meet the Press Facebook page.